I've been doing plenty of hype reading of late and that always has me yearning to get back into some good,solid,grounded soul food. Looking at my book stack it seems to be emerging from the books with the monochrome covers at the moment. However,get thee behind me Blog of the Hill. 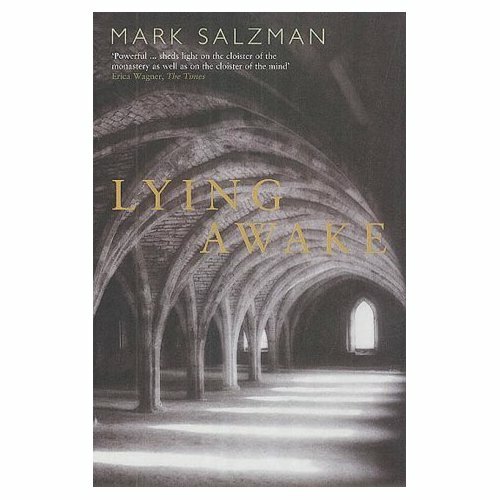 Lying Awake by Mark Salzman was another Persuasive of Longbarn recommend.Roth and then this, it's too much temptation for this weak bookaholic's soul, but two perfect reads in succession. Unlikely I know, but if perchance Pof L left you with any shred of doubt, dispel it forthwith, it's now a Definite from Devon too. Spend that £6.99 with impunity. These are books to read and read again. Sister John of the Cross lives in a Carmelite Monastery on the outskirts of Los Angeles.The discovery that her religious visions may be the result of an operable and curable brain disorder leaves her in something of a spiritual dilemma.To proceed and risk the essence of her vocation or continue in this possibly false state of grace. This was a peaceful and yes, it has to be said, contemplative read on the manifold struggles of the religious life; no leanings towards religious vocation or faith required but there is an all-night vigil that will move you to wonder.Ultimately one of those books you are delighted to have discovered. We had a Carmelite Monastery in the town for many years and I now understand that the one we called "The Trolley Nun" was the Extern (in our case the one we always saw going for the shopping with a wheely basket).I only ever saw one of the enclosed Sisters, in fact I nearly ran her over, as she glided across the road from the monastery to the cottage hospital opposite. It was that sort of unexpected vision in the middle of the road on what is, unfortunately, the most dangerous, uphill blind bend in the town.Incidentally it's no advantage to be run over outside the cottage hospital, an ambulance still has to be summoned 15 miles away from Plymouth to carry you inside. But I digress, sadly over the years, and thankfully through no fault of my distracted driving, the Sisters diminished down to three, so it was no contest between keeping their sanctuary versus the prime location on which it sat becoming an estate of new houses, tactfully now called Carmel Gardens. More Nun reads to follow, they have a certain mysterious allure, especially for those of us who didn't go to Convent school.